If you like orienteering, try this with your compass. This course follows the Madison Cascades trail so don’t follow a direction that leads you off the trail. This is for those who want to practice orienteering. It is not a bushwhacking trail for experts. Practice determining the distance of your “pace”. Train it to be 5 feet and your life will be easier. I used FEET for distances not steps or paces. In front of the Madison Historical Society building there is a commemorative plaque. Look to the left and see a hiking trail sign and stand near it. This entry was posted in Madison Cascades and tagged Orienteering on April 18, 2010 by madisonhiker. Parking in winter is always an issue. You are probably not allowed to park on East Shore Drive. You might be able to push your way onto LMR. The other end of LMR has more options for parking. The whole road is about 1.2 miles. As of the 2007 Town Meeting it was designated as a class V road to summer cottages. This allowed the designation to conform to the practice of not maintaining it in the winter. The road is shared by snowmachines, snowshoers, cross country skiers, and hikers. 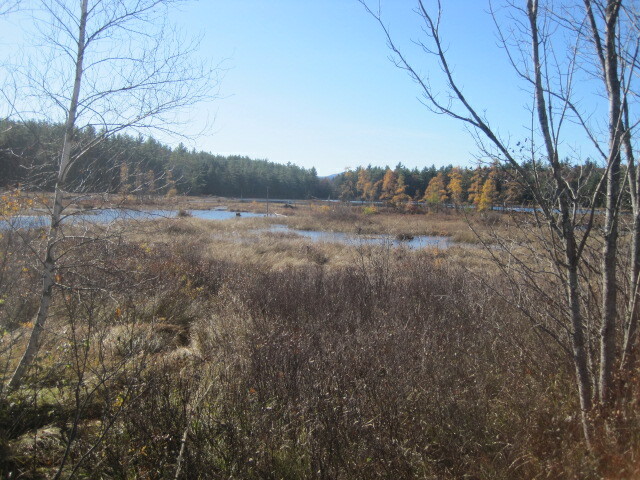 There are trails off the main road including a trail to Winter Road, a loop around Goodwin Bog, a path to Cook’s Pond, a power line, and several other paths. The actual Lead Mine is a deep hole in the ground with steep sides filled with water which can be dangerous. Remember to leave your hiking plan with someone including your anticipated time of return. This entry was posted in Goodwin Marsh Loop on February 27, 2010 by madisonhiker.